Celebrate the 2015 University of Toronto Korea Week, Journey Through Korean Traditions, with Reel Asian and the Asian Institute. On October 26 and 27, Reel Asian is proud to sponsor Korean Canadians Behind The Screen: In Conversation with Albert Shin and Gloria Kim. Join us on the first day for a special screening of Shin’s award-winning drama In Her Place, preceded by Gloria Kim’s short film The Auction. Both filmmakers will be in attendance on the second day for an in-depth panel discussion on the cultural impact on their artistic and creative productions. FREE admission to both events – please make sure to register your attendance in the links below. Albert Shin was one of the mentors for Reel Asian’s Unsung Voices Summer Youth Video Workshop last year. Reel Asian showcased Gloria Kim’s breadth of work at our festival in the past. Kim was the winner of the So You Think You Can Pitch competition in 2013. Her winning film Flamenco is playing at our festival this year as part of The World’s A Stage shorts programme. Screening of Albert Shin’s critically acclaimed feature, In Her Place, preceded by Gloria Kim’s short film The Auction. Inspired by Korean culture’s strong stigma against adoption In Her Place stars Kil Hae-Yeon and Ahn Ji-Hye as a mother and daughter living on a farm in Korea. When the teenage daughter becomes pregnant, a woman (Yoon Da-Kyung) arrives from Seoul to propose a secret adoption, conditional on her staying with them for the duration of the pregnancy so that she can hide the adoption when she returns to Seoul after the baby’s birth. It’s Christmas in Toronto, 1978. 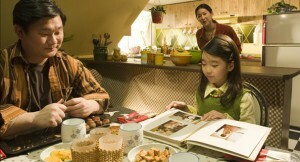 Eight-year-old Meehee Park longs for two things: to make her mother happy and to get a Cindy doll from Santa. While selling her toys at a shop, she comes across an auction that will pit her two greatest desires, leaving Meehee to make a difficult choice. A semiautobiographical tale of immigrant dreams, The Auction is a poignant blend of narrative and director Gloria Ui Young Kim’s found family footage. Influenced by their upbringings as first or second-generation immigrants, Asian Canadian filmmakers and artists have foregrounded identity and belonging as a recurring theme in their work. In this panel and discussion, Korean Canadian filmmakers Albert Shin and Gloria Kim will share their experience of living and working in different cultural settings, and discuss how that has impacted their artistic vision and cinematic practice. As they extrapolate the identities of fictional characters on screen, what have they learned about their own?